FIX fuel related issue with Mechanic In A Bottle. Suitable for both 2 & 4-Stroke engines. It removes all varnish in the fuel system without having to remove the carburettor, removes carbon deposits and water, revitalises rubber and plastic components, replaces lost Octane, and rejuvenates old fuel. Cleanses your equipment’s fuel system so that it starts efficiently and operates in top condition. Mechanic In A Bottle is part of the multi award winning family of fuel solution products from B3C. This product range is scientifically engineered to provide a quick, easy, and effective means to TEST - FIX - PREVENT the problems associated with modern day fuels. 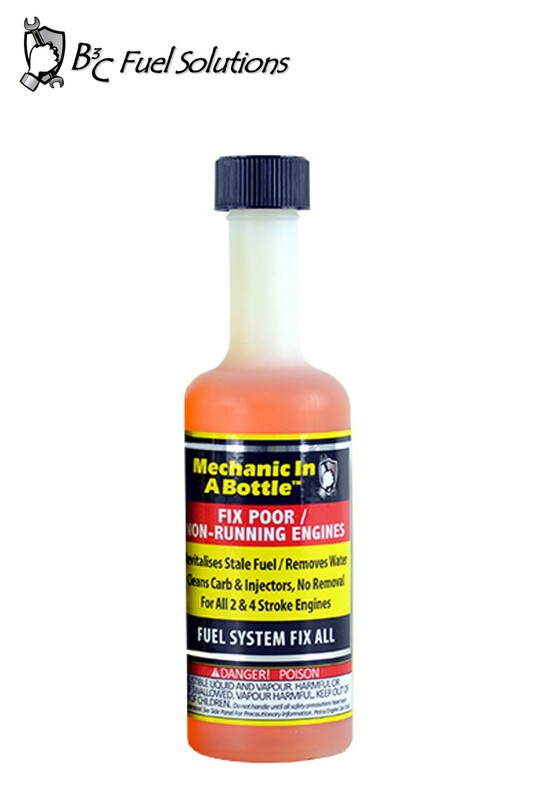 Application: Mechanic In A Bottle is suitable for both 2 & 4-Stroke engines. It is designed to combat and help FIX fuel related issues on poor or non-running engines. It is also recommended to be run in machinery during its first use after being stored for an extended period. (Use poor running dosage). On-Machine Carburettor Cleaning: Works to clean out varnish in the fuel system without having to remove the carburettor. Reconditions Rubber & Plastic Parts: Dual lubricants condition rubber and plastic components and rejuvenates rubber gaskets and seals that may have been dried out by ethanol. Revitalizes Old Fuel: Restores old, decayed fuel by breaking down carbon deposits. Safely Dissolves Varnish/Shellac: Safely cleanses internal engine components. Carbon Cleaner: Cleanse power-robbing carbon deposits from engine’s internal components. Removes Water: Removes water that causes corrosion and poor running. Fuel Stabilisation: Keeps engine in top working condition, avoiding repairs and downtime. Octane Booster: Added to replace lost Octane. the engine and run for at least 15 minutes. It starts working in as little as 15 minutes. Performance improves over time. Do not drain the fuel tank. Non-running engines: Drain the fuel completely. For small power equipment, (e.g. Brush Cutters, Chainsaws, etc. ), add 60ml into the empty fuel tank. For larger equipment (e.g. Lawn Tractors), add 120ml. Work the MIB into the carburettor using the primer bulb or starter mechanism. It starts working in as little as 15 minutes. For the best results, let the engine sit for at least 4 hours before restarting. Do not drain the MIB from the tank, add fresh fuel and follow the starting instructions. With severely contaminated fuel systems; let the MIB stand in the system overnight. Repeat as necessary.